Syrocco Reveille has a problem: she's very competitive. Of course, that's not the worst problem in the world, especially if you're aiming for a slot on the US Team for the World Endurance Championship in the 2010 FEI Alltech World Equestrian Games. "If there's anything in front her, she will not quit till she passes them," says her rider, Meg Sleeper, 42, a veterinary cardiologist from French Town, New Jersey. Reveille certainly did not quit in winning the March Fun in the Sun Pioneer 100 in Florida in a very competitive field in one of the fastest hundred miles recorded in the US: 7 hours 44 minutes. She and Meg Sleeper tied for first with Kathy Brunjes and Theatric, with Cici Butler-Stasiuk and DJB Montyonthespot, and Valerie Kanavy on King Ali Gold - all WEC-qualified horses and riders - third and fourth. Syrocco Reveille is no stranger to international competition, either: the 10-year-old mare participated in the 2008 World Endurance Championship in Malaysia. She made it through the 5th loop before being pulled for lameness... and that just might have had something to do with the bolt of lightning that knocked both her and Golden Lightning (ridden by Jan Worthington) to the ground on the second loop. 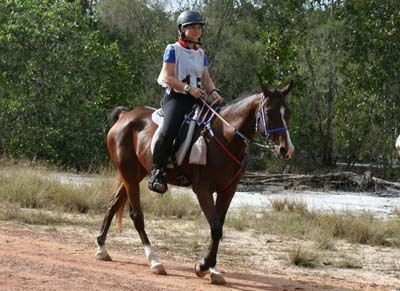 Reveille's competitive attitude was something that had Meg worried about at the crazy starting line in the Malaysia WEC, where horses were acting up, bucking their riders off, and taking off at a gallop. "It took Reveille a couple of years to learn to be calm and focused at the start of a ride - but there she was [at the Malaysia start] grazing while the horses were running around her. I had no idea she'd ever get to that point!" Reveille is a delight to ride: "She's a very light mover, very effortless, very comfortable. She skims along. She has excellent recoveries, usually under 2 minutes." Her impressive US record shows 16 completions of 17 starts (7 of them 100 milers), 2 Best Condition awards, and the AHA championship award in 2009. Best of all - she's a homebred. "I've been lucky," says Meg. Since 2001 she's been able to compete internationally in endurance on her homebred horses. "It's just an amazing feeling. There's the whole thing about representing your region, your country - it's hard to describe if you haven't felt that. The people are just incredible - on a local and larger scale - you meet different people with different backgrounds, all trying to accomplish the same goal. The neat bottom line is you're all doing what you love." Syrocco Reveille is in fact one of two homebred horses Meg has the pleasure of being qualified on for the WEC. Though he's only 8 and lightly raced, Syrocco Harmony has shown Meg a lot. He's completed 8 of 9 rides, including 2 hundred milers - one of which was the pre-ride for the World Endurance Championship in Kentucky in the mud last year. 'Harmon' (named after one of Meg's mentors in veterinary cardiology) finished 6th individually and helped the US team win the gold medal. The gelding is bigger than Reveille, has more muscle and is more solid, and "he gives 110%, all the time. He could be phenomenal," says Meg. Meg started riding when she was 11, after begging her parents for lessons. Since then she's done over 14,000 miles in CTR (Competitive Trail Riding) and endurance. She considers herself competitive; but for her it's more about the experience of riding. "It's about seeing parts of gorgeous countryside (even in the Northeast), that you'd never see otherwise. And that's just multiplied when it's in another country." It's a huge commitment, bringing homebred horses along all the way to the level of international competition - but she loves it. Her husband David Augustine, a farrier, lives it and loves it too, helping Meg with the training, shoeing, and crewing of Reveille and Harmony, and the 13 other horses they have. "We've been striving toward this [the US WEC] for at least the last 2 years. When you bleed and sweat it for so long, you have to love it!" And so Meg heads to the Selection trials in Illinois with two qualified, problem horses - one who won't stop till she passes all the horses in front of her, and the other who gives 110% all the time. Sounds like good problems to have.